Artist Emily Lou Packard was a sly artist who coined the term “militasaurus” for a fictional primordial creature which would “become extinct because he is over-armed.” The Kaiser Industries world headquarters in Oakland featured her 1967 mural of the “Peaceable Kingdom.” But the glass eyeballs disturbed patrons. This illustrated article tells the story about this fantastic 6’x26′ artwork that’s been in storage at the Oakland Museum of California since 1980. 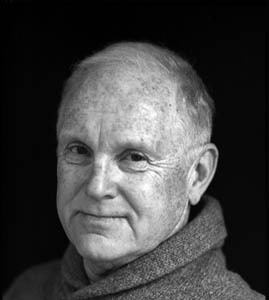 Categories: Arts, Bay Area, History, Northern California, Politics | Permalink. 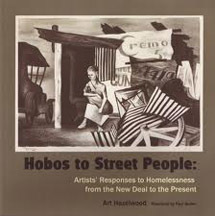 Hobos to Street People: Artists’ Responses to Homelessness from the New Deal to the Present, by Art Hazelwood. Freedom Voices Press, 2011. Curated and edited by Art Hazelwood, this book also serves as an illustrated catalog for a travelling exhibition. It examines social stereotypes about our populations that have fallen through the “safety net” from the Great Depression to our current Wall Street-fueled miasma. Social justice artists from the 1930s are mashed up with those of today, including Doug Minkler, Jos Sances, David Bacon, and Eric Drooker. More than just an aesthetic examination, it explores the analyses and community-based institutions that challenge this tragic byproduct of capitalism. 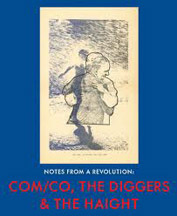 Notes from a Revolution: Com/Co, The Diggers, & the Haight, by Kristine McKenna and David Hollander. Foggy Notion Books, 2012. The Diggers were one of the legendary Bay Area countercultural institutions of the late 1960s. They used street theater, modern communications systems (e.g., the Gestetner duplicator), humor, poetry, and a passion for liberation to challenge the dark side of private property and corporate greed. They were outrageous, wild, and very subversive. The text includes interviews coupled with reproductions of their colorful and evocative flyers. Not indexed, but includes a helpful timeline. 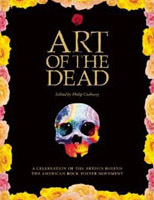 Rather than just another rock poster book, this one explores how the dynamic evolution of a unique band – The Grateful Dead – spurred artists to push technological limits and breed a distinct graphic style. Cushway has done his homework and knows what he’s talking about, but he lets others tell the story. Interviews and annotations help the viewer to examine cryptic typography, layered imagery, and the magic of offset printing. Richly illustrated with beautiful reproductions of work ranging from the famous (Wes Wilson, Stanley Mouse, Rick Griffin…) to the unknown. Indexed. Categories: Arts, Bay Area, History | Tags: counterculture, graphic art, homeless, poster, social justice | Permalink.